A lifelong member and supporter of the Gene Slay’s Girls & Boys Club, Tom Wild followed in the footsteps of his father, former Executive Director Ken Wild, and successfully guided the Club for many years. Tom was born on September 19, 1952 and joined the Club as a member in 1958 at the age of six. Tom excelled at baseball and basketball while playing on the Club’s travelling teams. Tom began working as a Jr. Staff Member in our Job Readiness Program in 1966. Tom studied Business at the University of Missouri Columbia, and became a full-time staff member in 1977, where he served in a variety of coaching and administration capacities. In 1982, Tom became Associate Athletic Director where he worked closely with Charlie Nash. When Ken Wild retired and Charlie became Executive Director, Tom was promoted to Assistant Executive Director. When Mr. Slay organized the first Annual Golf Classic, Tom was his right hand man. Tom continued to coordinate the tournament every year, and it is through Tom’s hard work and dedication that it provides so much support today. Following Charlie Nash’s retirement in 2005, Tom assumed the role of Executive Director. 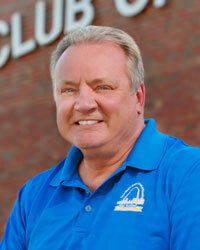 Tom continued to grow the Annual Golf Classic and work closely with the Board to expand and enhance GSGBC. Tom retired at the end of 2014 and passed the torch to Prescott Benson. Tom’s loyalty and dedication to the Club are second to none, and his passion for preparing youth to realize their dreams is infectious. As Executive Director Emeritus, Tom continues to be a staunch supporter of GSGBC in his heart and in the community. A devoted husband and father, an outstanding businessman and philanthropist, Gene was often described as both a teddy bear and tiger. 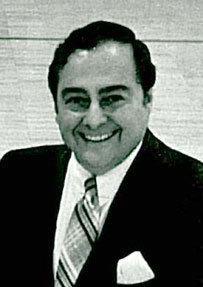 Eugene P. Slay was born in 1927. Gene was one of seven children growing up on Hickory Street in south St. Louis. Gene was a sports enthusiast throughout his life. At McKinley High School, he excelled in football, baseball, track, and wrestling. In 1944, as a teenager, he was the Missouri State and Ozark A.A.U. Wrestling Champion. He was offered an athletic scholarship to Saint Louis University but World War II had not yet ended and he was drafted for military service. He proudly served from 1945 to 1947; he was in the 7th Division of the U.S. Army, serving his tour of duty in Korea and Japan. Upon his return from military service, Mr. Slay met his future wife Joan Schadlbauer on the Admiral Cruise ship in St. Louis. They married in 1952 at St. Vincent Catholic Church where he had attended grade school. Together they had seven children: Jeanne, Gary (Laura), Guy (Bob), Glen (Carla), Jill (Jeff) Garlich, Janet (Matt) Westphal, Jeffrey, and twelve grandchildren: Gary, Jacob, Natalie, Kayla, Olivia, Glen, Joanie, Julia, Jeffrey, Alex, Sabrina, and Anthony. Family was important to him, and like his father, Gene has strong entrepreneurial skills. In 1948, Gene joined his father and began making deliveries throughout the city for the transportation company. During this time, he nurtured relationships with established clients and began developing new customers; his advancement with the company was rapid and impressive. Gradually, in addition to transportation, Gene developed warehousing, packaging, and barging operations, expanding his father’s small commercial enterprise into one of St. Louis’ largest privately held businesses, operating in 48 states, Canada, and Mexico. While growing his business, he was always mindful of helping others. He believed it was an honor to give back and truly cherished the opportunity to be such a pillar in the philanthropic community. In the early 1960s, Gene, along with Danny Thomas, Alex Aboussie, and other influential Lebanese businessmen, helped form the St. Louis Chapter of ALSAC, the American Lebanese Syrian Associated Charities. The main focus of ALSAC was to raise money for St. Jude Children’s Research Hospital, fighting catastrophic illnesses and diseases affecting children. For his outstanding effort, Danny Thomas presented Gene with an award for outstanding support of the St. Louis Chapter of ALSAC and his other civic and charitable activities. In 1993, he organized and chaired a benefit for war victims of Lebanon. The event was called “Lebanon We Care,” a Las Vegas-style variety show at the Fox Theatre. Headliners included Danny Thomas, Danny Grans, Rita Moreno, and other celebrities. He was involved in countless charities and has been commended for his efforts decade after decade, including The Backstoppers, the St. Louis Italian Open for Children’s Charities, St. Louis Rams Chapter of NFL Alumni, Faith House, and the APDA. As a boy, he was a member of the St. Louis Boy’s Club and found himself continually going back to the Club on South 11th Street to help and contribute toward the development of young boys in need. He served as President of the Club and became Chairman of the Board in 1993. He pursued his dream of creating an endowment large enough to become self-sustaining. Through his leadership, a premier annual golf outing at Norwood Hills Country Club was initiated and became the cornerstone of the fundraising to accomplish his dream. In 2006, in recognition of his long term contributions, the St. Louis Boy’s Club was renamed the Gene Slay’s Boys’ Club of St. Louis in his honor. He believed that to be successful, one must know where he came from to truly know where he was going. His family cherishes fond memories of his love of family and the excellent example he set by his compassion and generosity. His legacy will be the many lives he touched young and old, near and far, and the obvious ways he left the world a better place than he found it. Charlie Nash is the epitome of the Boys’ Club of St. Louis success story. Nash was a typical neighborhood kid with the gift of a strong personality and the curse of little leadership in his life. It’s safe to say that Nash was struggling to find his path until he found his life’s calling at the Boys’ Club of St. Louis. Charlie Nash started his affiliation with the club as a member and instantly found a father figure in Ken Wild. Under the nurturing of Wild, Nash excelled in all sports and played a key role on the legion baseball teams and varsity basketball teams. Nash captained many teams and accomplished numerous basketball records including most points scored. Nash joined the Boys’ Club professional staff as a Program Supervisor in October of 1964. He was promoted to Athletic Director in January of 1969. Under Nash, the athletic programs flourished as the Boys’ Club sported varsity teams at every significant age group in swimming, football, baseball, basketball, and later, soccer. Boys’ Club teams, no matter the sport, earned reputations for their fundamental and competitive play and sportsmanship. Upon Wild’s retirement in 1991, Nash assumed the leadership of the Club as Executive Director and held the post until his retirement in February of 2005. As a tribute to his lifetime of service and honor of his body of work, the Boys’ Club Board of Directors named Nash, Director Emeritus. Nash formally retired at the end of 2007. Ken Wild, a former professional baseball player, led the Boys’ Club of St. Louis for more than 30 years and made a significant contribution during an exciting era of expansion from 1960 to the 1990s. 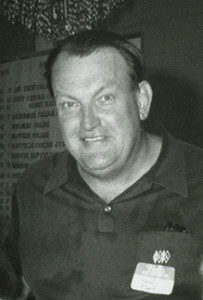 Wild started his affiliation with the Club as a volunteer coach in the mid-1950s and was later named Athletic Director in the late 1950s and quickly elevated to Executive Director in 1960. Under Wild, many of the Clubs’ varsity athletic programs and athletes achieved national and international recognition. And many of the significant facility expansion projects took shape. Under the watchful eyes of Coach Joe Joseph, the club produced many championship weightlifting teams. One of Joseph’s lifters, Gary Cleveland, finished 5th at the 1963 World Championships. Cleveland was later selected to represent the United States in the 1964 Olympic Games in Toyko, Japan where he placed 5th. Under Wild, the Club sported varsity teams in baseball and basketball that performed well in local and national competitions. In 1969, our Juvenile Varsity (15-16 year old) baseball team won the National Championship as the best team in the country. And many of the Boys’ Club youth basketball teams won district AAU titles and represented St. Louis with pride at National-level competitions. Against all odds and logic, Ken Wild founded and coached the only boys’ club college varsity basketball team in the United States. The Boys’ Club of St. Louis varsity team played a schedule of regional junior college, junior varsity and even varsity teams; Wilds’ players had graduated high school but were not enrolled in college and maintained their eligibility. A majority of the Boys’ Club players came from low-income families. More often than not, players didn’t even have the luxury of playing for their high school because they had to work to help financially support their family in addition to attending school. These young men also formed the core of the Club volunteer program serving as referees and conducting sports clinics for the younger members. As an added benefit, Coach Wild placed one his varsity members on the roster of a college program almost every year. In the 30-year history of this unique program, Wild’s teams won many games including his landmark 500th victory on December 6th 1989. This is quite an accomplishment for any team and coach, but the most prized victory for Coach Wild was helping his players earn a college scholarship to fortify their life with education and life experience. Wild spearheaded three major expansion projects during his tenure: construction of the swimming pool in 1969, the athletic field expansion in 1979, and air conditioning the Club in 1989. The air conditioning capital improvement project was kicked off with a major St. Louis society event. Anheuser Busch was the presenting sponsor of the soiree at the Adams Mark hotel in November 1989. Tony Bennett, Norm Crosby, Jack Buck and Spuds Mackenzie headlined the event. Due in large part to the proceeds generated from this event, the Club completed the air conditioning project in 1992. Wild retired as Executive Director in January 1991. He was appointed Director of Club Relations and held this post until his death in September of 1997. The legacy of Ken Wild’s tenure is one of innovation, leadership, mentorship and significant contribution to thousands of lives by staying true to the Clubs’ mission of helping to develop character in disadvantaged youth. Under Wild, the Boys’ Club of St. Louis became one of the leading youth service providers in the nation. In 1929, Reverend Charles P. Maxwell was named by Archbishop Cardinal Glennon as the first “Catholic Youth Director of St. Louis.” Maxwell’s mission was to work with all boys, regardless of race, color, or creed. Maxwell selected the “slum area” or “Soulard Police District” which had the highest boy population and the highest juvenile delinquency rate in the city. When the Boys’ Club of St. Louis opened its doors on October 3, 1929, their home was the abandoned St. Vincent’s Parochial School building located on the southwest corner of 9th and Park Avenue. The three-story building was remodeled to offer a gym, game room, showers, and other necessary facilities. To finish construction, Father Maxwell solicited money and materials from friends, St. Louis businesses and professional people. On opening day over 400 boys registered as members. During the early years, the Boys’ Club of St. Louis often found it difficult to meet monthly operating expenses. Because the predecessor to our now United Way had a three-year waiting period before being eligible to apply for funding, Father Maxwell repeatedly asked friends, business people and companies to support his mission. In 1930, John McCormick, the famed Irish tenor, gave a Benefit Concert in the old St. Louis Coliseum to support The Boys’ Club. This performance raised almost $7,000. In 1932, the “Notre Dame All Stars” led by the famed All-American quarterback, Frank Carideo, played a Benefit Football Game before a capacity crowd of over 17,000 fans at Walsh Stadium. They faced an All-Star squad of varsity players from St. Louis University and Washington University. This event raised over $10,000 for the Club. By 1933 the club had an active membership of over 1,200 boys, with an average daily attendance of over 400 youngsters. Over the next 30 years, the Club moved a number of times before completing and occupying the current facility at 2524 South 11th Street in 1959. Father Maxwell was instrumental in having the Stocke heirs deed a tract of vacant land as a gift to the Boys’ Club of St. Louis. This tract was the former site of the old Green Tree Brewery, located on the northeast corner of 11th and Sidney, in the densely populated tenement-area of the near Southside. Realizing that time was of the essence, Father Maxwell energized his Board of Directors and created a “Boys’ Club Building Fund.” The dream of a new facility was nearly shattered due to Father Maxwell’s untimely death, but the Board of Directors decided not to end this dream and to proceed with the building program as originally planned. On May 2, 1955, Mr. Harry T. Bussman, Jr., was unanimously elected President. Under his capable direction, business acumen and untiring energy, the drive to raise funds proceeded with amazing results. The facility plans were the creation of Raymond Maritz and Sons, Inc., Architects. On September 10, 1959 the cornerstone was laid and the building continued. The site covered an approximate square block that included a one-story brick building 200 feet long and 117 feet deep at a cost of over $450,000. 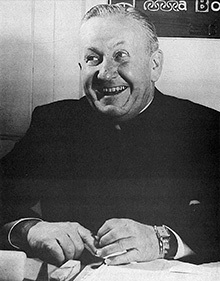 Father Maxwell remained as Chairman of the Board of Directors from its founding in 1929 until his sudden death on April 5, 1955. Throughout his service to the Boys’ Club, he simultaneously carried on his duties as Pastor of a large St. Louis Catholic Church parish.